The BYD S6 production line at a plant in Shenzhen, China. A decade ago, the Asia-Pacific region made up less than one third of global vehicle assembly. By 2014, it made up more than half of global vehicle assembly. Demand in China has global light-vehicle output still tilting overwhelmingly toward Asia, but the North American market is still expanding, with production in Mexico growing more than the U.S. and Canada last year. The Asia-Pacific region dominated vehicle assembly in 2014, claiming more than half of global production. The pace of growth in North American vehicle assembly exceeded growth in the global market for the fourth consecutive year. The expansion of light-vehicle output in Mexico outpaced both the U.S. and Canada’s faltering auto sector, according to a report by the University of Windsor. Total global production of light and medium vehicles last year was nearly 85.6 million units, up 4.5 percent from the year earlier. North America’s standing will slip in the next few years, according to the report. Its share of worldwide production will decline to 19 percent by 2018, compared to 21 percent last year, the report said. 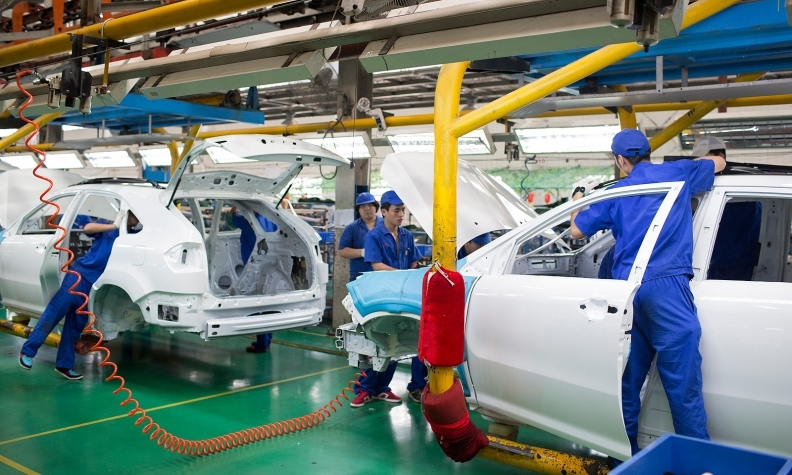 Production in Asia-Pacific region will increase to 52 percent of the global market, compared to 51 percent in 2014, while European vehicle production will dip slightly to 23.5 percent of all output, from 23.8 percent last year. Nearly all of the growth in vehicle ouput from 2014 until 2018 will be outside of North America, according to the report. Vehicle assembly and sales in China, the world’s largest new-vehicle market ranked by sales, continue to be strong, though the pace of growth is slowing. A decade ago, the Asia-Pacific region made up less than one third of global vehicle assembly, according to the report. By 2014, it made up more than half of global vehicle assembly. Production increases as sales grow, and with China’s middle class growing, the country’s boom will continue, said Pete Mateja, co-director of automotive and vehicle research at the University of Windsor’s Odette School of Business. Vehicle assembly in North America increased 6 percent in 2014 to 17.6 million units, or 21 percent of the global market, the highest vehicle assembly in North America since a record 17.7 million vehicles were built in 2000. Ford, GM and Fiat Chrysler vehicle output in North America is expected to dip to 53 percent by 2016, compared with 60 percent in 2011, the report said. The majority of vehicle production growth in North America from 2015 to 2018 will come from Japanese, European and South Korean automakers. Mexico will see the most growth, he said. Low labor costs, a growing automotive supply base and free trade agreements that make Mexico ideal for exports have driven its production growth. Vehicle production in the U.S. is still more than three times higher than in Mexico, but Mexico output last year surged 10 percent to 3.3 million units, while assembly in the U.S. grew 5 percent to 11.7 million units. Vehicle assembly in Canada, however, is in jeopardy because of uncompetitive labor contracts, unfavorable currency exchange rates and a small market compared to the U.S., Mateja said. The country produced 2.5 million units, up 5 percent from 2013, but investments in Canada are in continued operations, rather than new operations.